Posted on March 6, 2019 at 4:04 pm. Need To Impeach and Free Speech For People hosted a press conference last month ahead of an impeach Trump advocacy day on Capitol Hill where 300 citizens from across the country met with their Members of Congress to deliver draft articles of impeachment and copies of the book The Constitution Demands It: The Case For The Impeachment of President Trump. Posted on February 5, 2019 at 12:49 am. Posted on January 21, 2019 at 6:25 pm. Posted on January 17, 2019 at 8:06 pm. 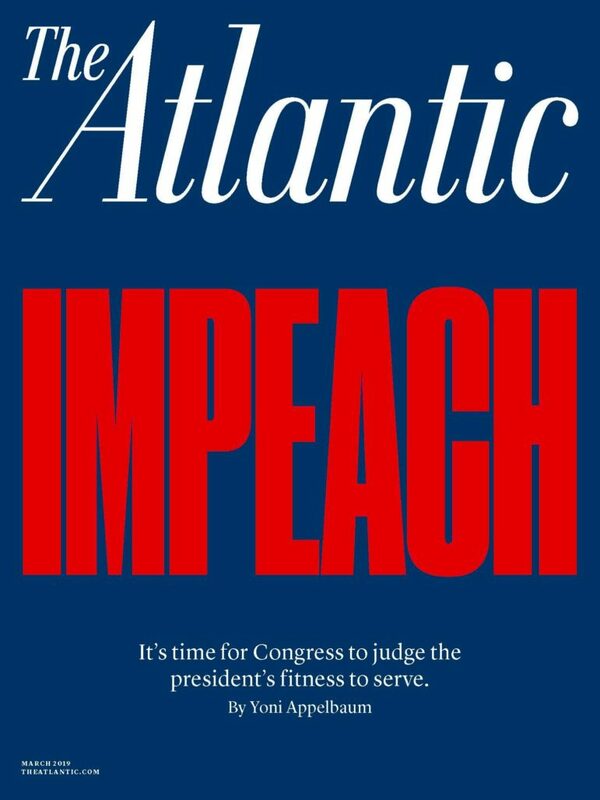 The March 2019 issue of The Atlantic features an important piece by historian Yoni Applebaum, in which he lays out the case for why we must begin the impeachment process against President Trump. …[Trump] has mounted a concerted challenge to the separation of powers, to the rule of law, and to the civil liberties enshrined in our founding documents. He has purposefully inflamed America’s divisions. He has set himself against the American idea, the principle that all of us—of every race, gender, and creed—are created equal. Only by authorizing a dedicated impeachment inquiry can the House begin to assemble disparate allegations into a coherent picture, forcing lawmakers to consider both whether specific charges are true and whether the president’s abuses of his power justify his removal. [The founders] created a mechanism for considering whether a president is subverting the rule of law or pursuing his own self-interest at the expense of the general welfare—in short, whether his continued tenure in office poses a threat to the republic. This mechanism is impeachment…. Impeachment is a process, not an outcome, a rule-bound procedure for investigating a president, considering evidence, formulating charges, and deciding whether to continue on to trial. Read the article in Atlantic Magazine here. Want to get involved in the movement to hold President Trump accountable to the law? Click here to take action!